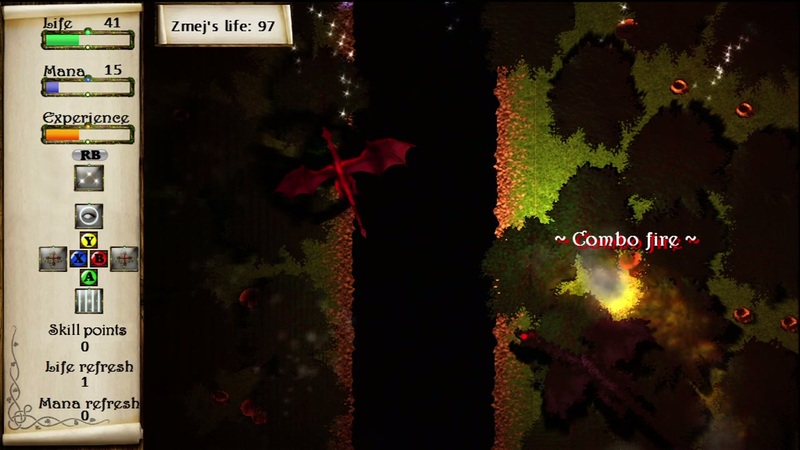 This week, we are looking at an XBLIG sent to us by Middle Lands Studios. 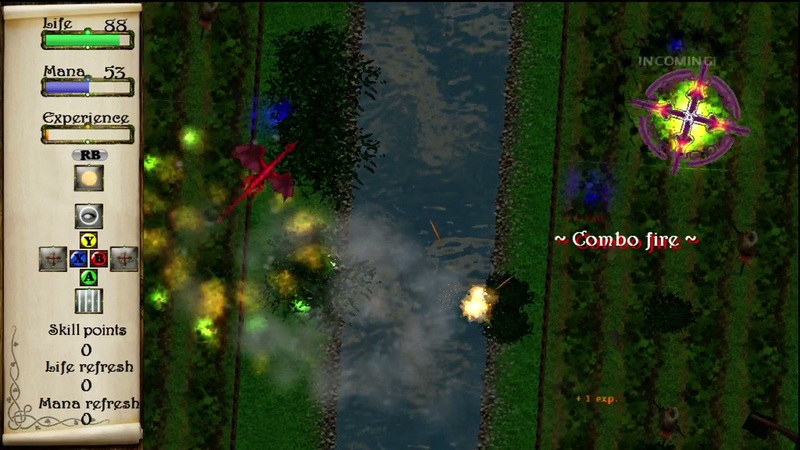 It is a unique take on the shoot’em up, incorporating such non-shmuppy elements as RPG-style level building and store-able health items. Can such an unusual concept hold its own? Read on to find out. Starlings, natural enemy of the mighty dragon. One of the first indications of whether or not an Indie Game is going to be worthwhile is the quality of the visuals. 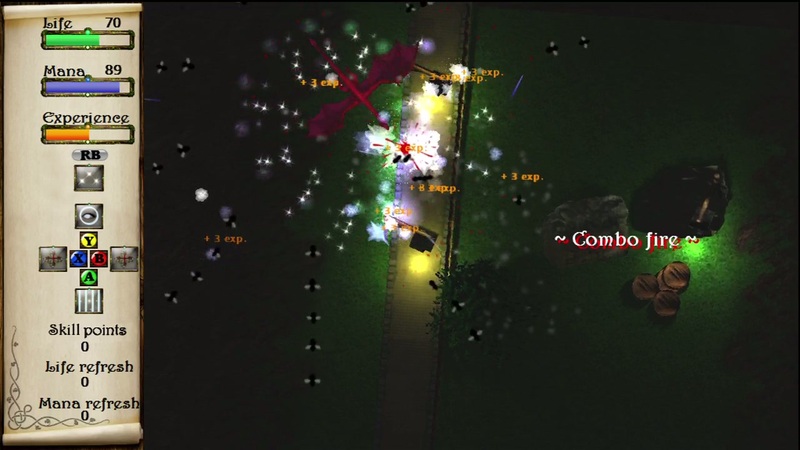 With the exception of retro-styled games, there is a strong tendency for Indie games to look amateur. This game manages to tread the thin line with its art. It is head and shoulders above what most Indie Games achieve, with artwork that is reminiscent of storybook illustrations. I wouldn’t stay that they achieve the same level that a game backed by a big publisher might, but if anyone you know could produce images half as good as we see in this game, you’d refer to that person as, “My friend the artist.” They lack the crispness and precision that we’ve come to expect from sprite based games, but they have a charm all their own. I especially like the way the dragon looks, but what can I say, I like dragons. The story is told in what I would call pop-up book fashion, where a slideshow of images slides back and forth to focus on the person speaking. 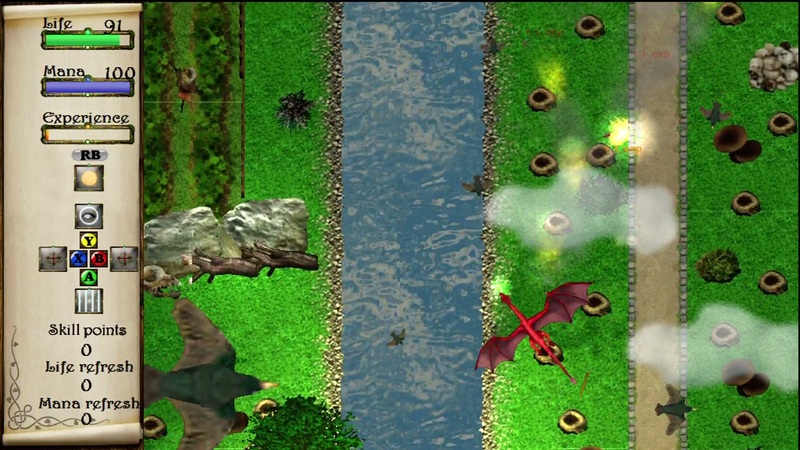 The game is played as a top down shooter, with the dragon and its various enemies and environmental hazards as sprites. 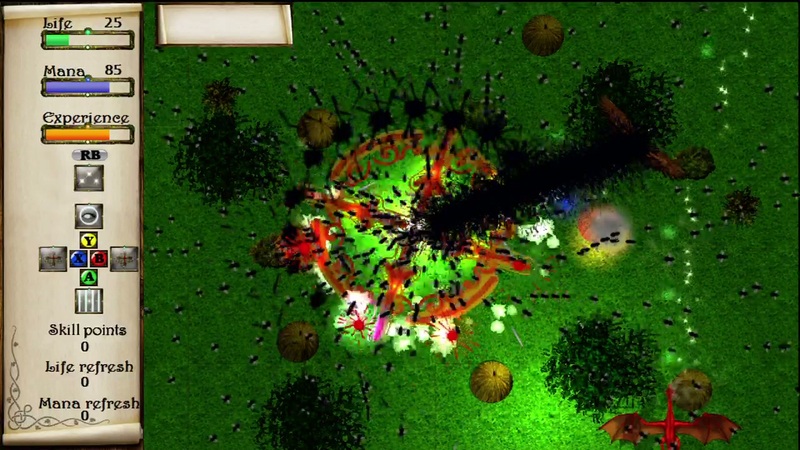 Spicing up the visuals are point lights and particle effects, here and there highlighting things and casting fancy shadows. 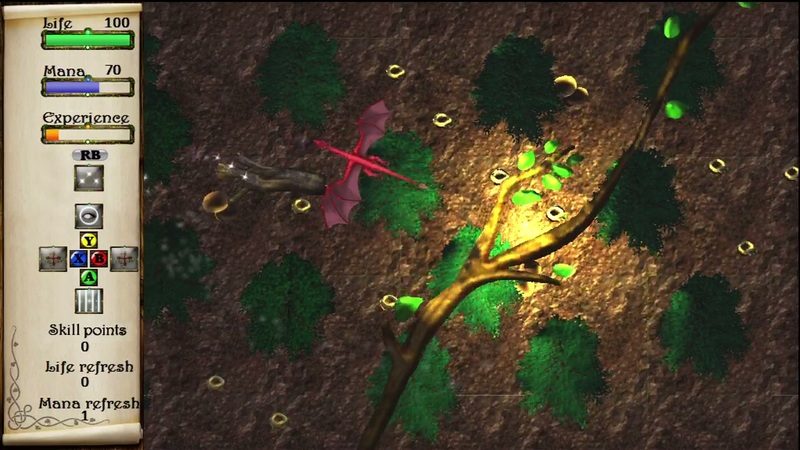 Animation is a little limited, but for the dragon protagonist it includes flapping wings and subtle tips to one side or the other. Occassionally I ran into something I couldn’t identify, such as what I could only assume was some sort of massive winged pie, but that was the exception, not the rule. I wasn’t floored by the visuals, but they certainly weren’t a weakness. Combo Fire ended up being my primary weapon when things started getting hairy. In its essence, this game is a shmup. 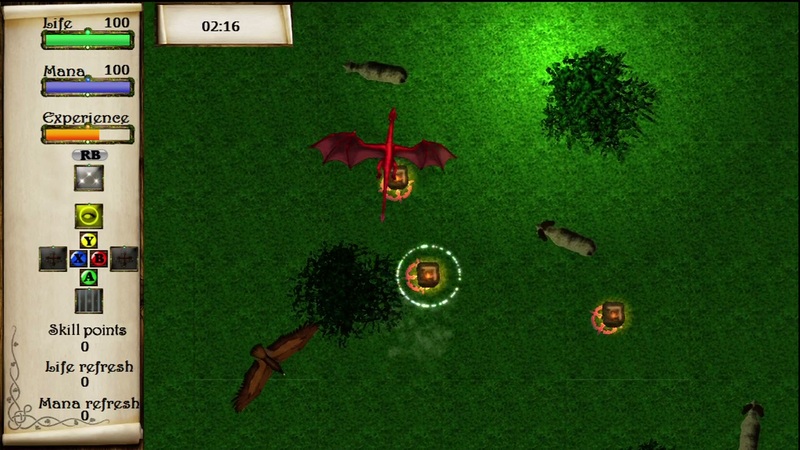 You play as the titular dragon, flying along in one constantly scrolling direction, heaving various breath-related ordinance at the hordes of enemies that are hurled at you. Now we will for a moment ignore the fact that you, an epic mega-dragon of divine origins, spend most of your time being poked to death by starlings and flies. The enemies are variations on the standard kamikaze creatures, dangerous pieces of landscape, and kamikaze creatures + projectiles. Your job is to spit one of your three primary attacks at them until they are no longer a concern. The attacks are the standard fireball, a twinkly fireball that bounces, or a fast but narrow weapon that does heavy damage if you are accurate. 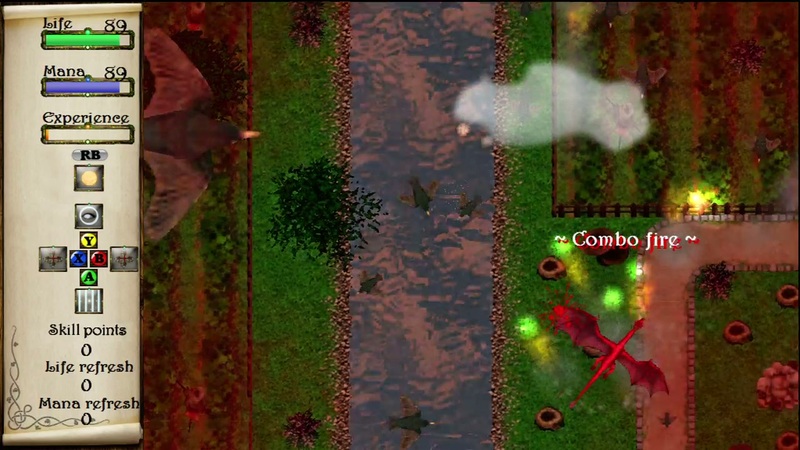 In addition to those, you’ll get spells that cover the spectrum from standard utility spells (healing, speed increase), to spells that take the place of traditional shmup powerups (auto-firing buddy, or ‘option’ for you Gradius devotees), or unique spells, like the telekinetic “blind wanderer” or the immobilizing “light prison.” The quantity and variety of these spells allows you to adopt any number of play styles, and since they are hot swappable during gameplay, and mappable to the four primary buttons, you don’t have to limit yourself to just one or two. 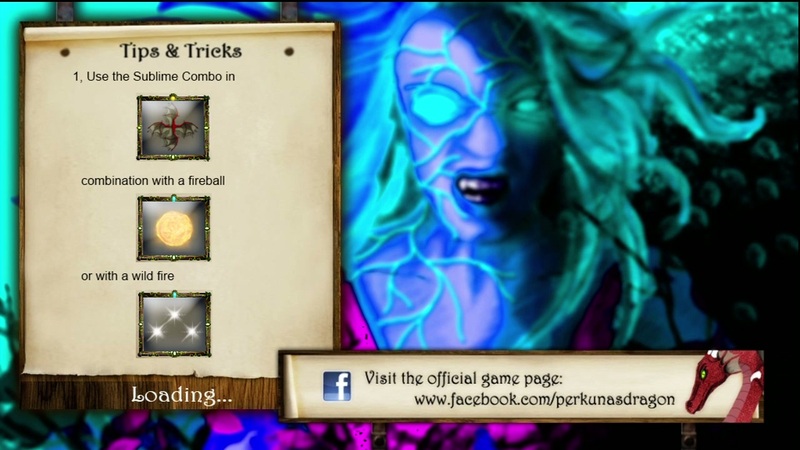 These spells and attacks are gradually unlocked or powered up by the application of skill points, earned by gaining 1000 experience. The experience is gained in the usual way (mass murder) and the spells are limited in the usual way (a mana bar). Many spells to choose from. 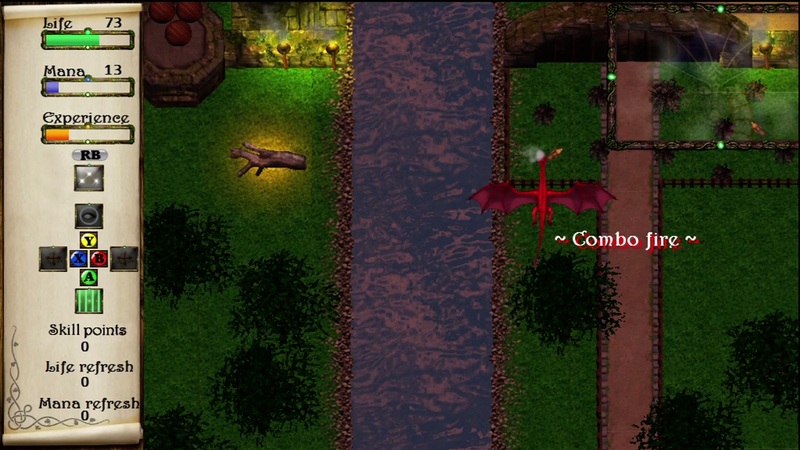 To give you an idea of how these spells come into play, one of the early boss fights is against another dragon with a fearsome but strangely familiar roar. 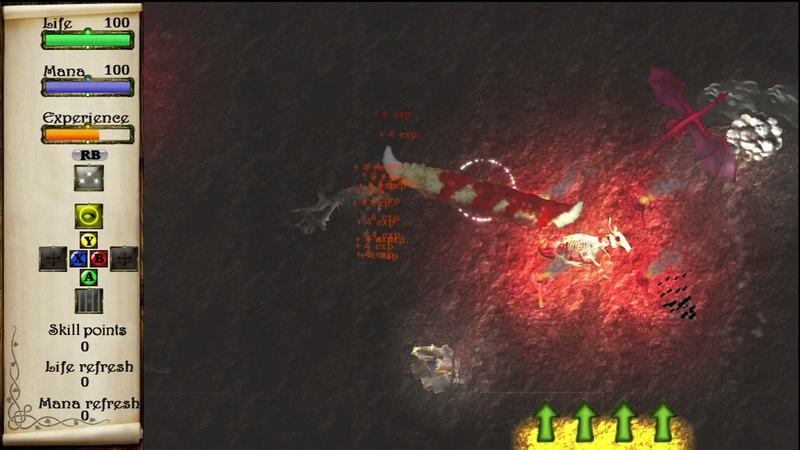 At first I was frustrated, since I could only fire forward, while he randomly wandered around the level, requiring me to spend most of the fight waiting for him to move into a position where I could shoot at him. Then I remembered the light prison spell, and quickly froze him in place where I could unload on him. I definitely like having a health bar instead of the standard “one hit by anything, anywhere, ever will kill you” policy of most shooters like this, although now and again you’ll find something that will sap that bar to nothing in a heartbeat. (Darn you burning cart!) 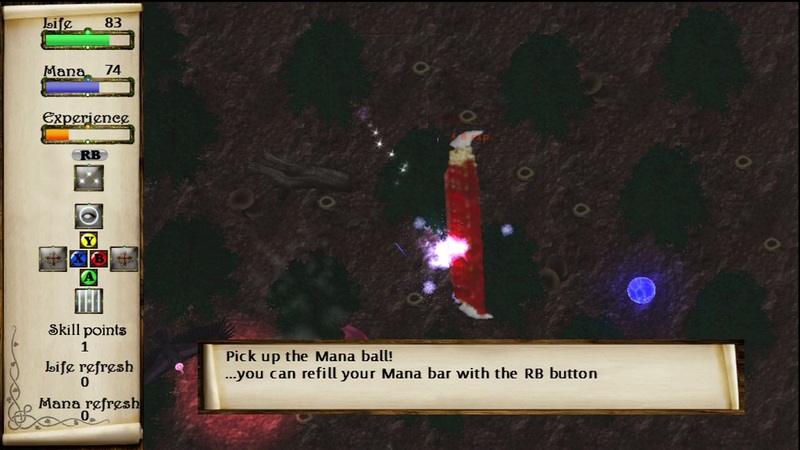 The mana bar is nice, too, because it slowly regains on its own, but also can be restored by mana balls found on the board. Even better is the fact that said mana balls, and their health bar equivalents (animals on sacrificial altars) can be stored until you need them, rather than being applied as soon as you touch them. On the other hand, while you don’t have a limited number of lives, you do have to start the level over every time you die, so you’ll get pretty darn familiar with the first part of the more difficult boards. This time the victory is mine, rotating tree of doom! Much as I enjoy these unique elements, there are many aspects to this game that just baffle me. There are puzzle levels, for instance, that obviously need to be solved by manipulating objects with your telekinesis spell, but other times there are puzzles that require the same spell, but there is little to no indication of what you need to do. Likewise, now and then a button will flash on screen, and pressing it before it vanishes will trigger a helpful lightning bolt, but there is nothing to suggest that would happen. Overall, the lack of useful tips made the game more frustrating than it needed to be. (There are actually tips on the load screen, but the game loaded so fast for me that I basically couldn’t read them. A rare case of two rights making a wrong.) Remember the dragon boss I mentioned? Well, after killing him the first time, a portal opened, but I had no idea what that meant. Then a few seconds later, the bad guy’s health bar filled back up and he killed me. It turns out, there was a final step to defeating this guy, making him a puzzle boss, but there wasn’t any feedback to suggest that there was a puzzle to be solved. There are attempts to break up the action with an obstacle avoidance level, where your goal is to avoid killing storks, but I found those levels more irritating than refreshing. Levels are navigated by selecting your next destination on a map, but rather than just allowing you to pick a prior level and play it again to level up, it requires you to effectively work your way back to earlier levels by playing each intervening level in reverse order. 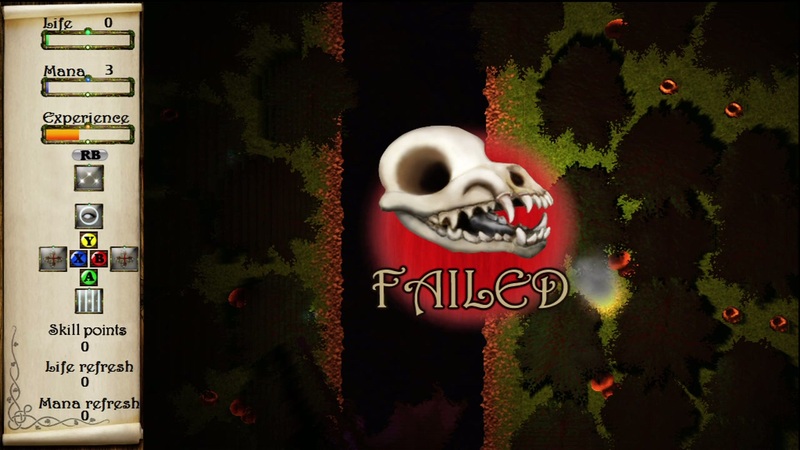 Also, though you might not run into it, I found at least one level that I was able to cause to crash fairly consistently. As I sit here writing this, I honestly can’t remember a single note of the music, but that isn’t a mark against. Unless it is spectacular, the music usually exists simply to set a mood, and that was done quite well in this game. The vocals are a little strange, featuring an accent I can’t identify. 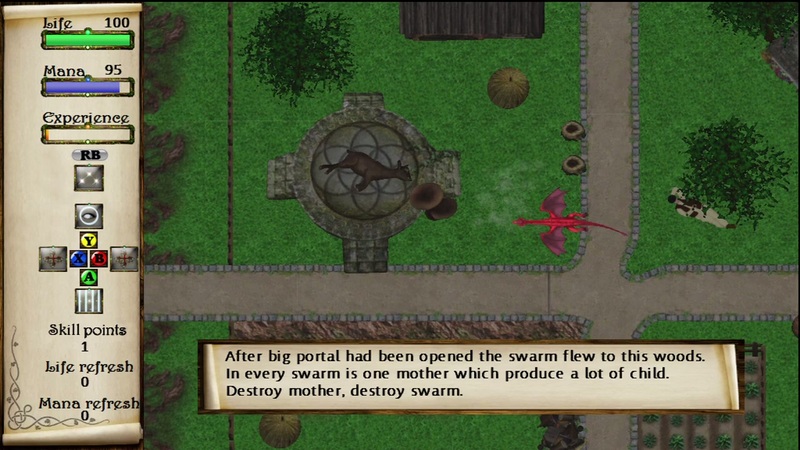 (Every now and then, the game warns you of incoming danger by saying “Be careful,” but the accent turns it into “Bee Carfool,” which is now a catch phrase around BLHQ.) This isn’t bad either. I actually felt like it helped to build the setting of the game, and there are plenty of retail games with bizarre accents and phrasing. (Powerstone’s “Are you ready/Ah-ooo Reh-ee?” is still a staple among the staff.) The one thing about the audio that totally yanked me out of the game was the presence of Godzilla’s roar. No, not something that sounds like Godzilla’s roar, his actual roar. The very same sound effect used for the films. I love that sound, but it is far, FAR too recognizable to be used as a boss noise unless said boss is Godzilla himself. I’m sure Toho’s lawyers would agree. The plot of this game is certainly head and shoulders above the story you usually get for a shmup, which traditionally is of the form “Here is why you are shooting everything. Now go shoot everything.”, and often not even that. 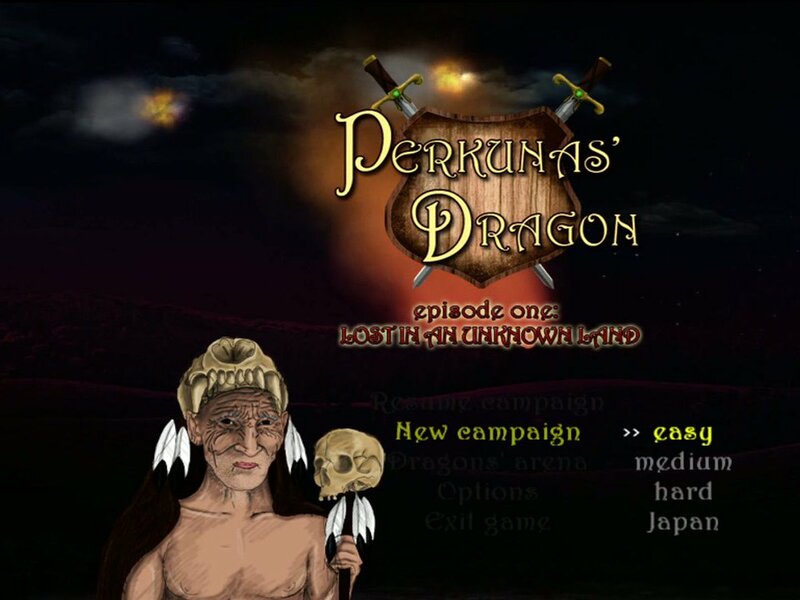 Your player character is a dragon, servant to the god Perkunas, summoned to perform a deed of great importance. Initially, this deed seems to be killing a bunch of birds, which even the dragon itself remarks as a strange reason to summon a dragon. 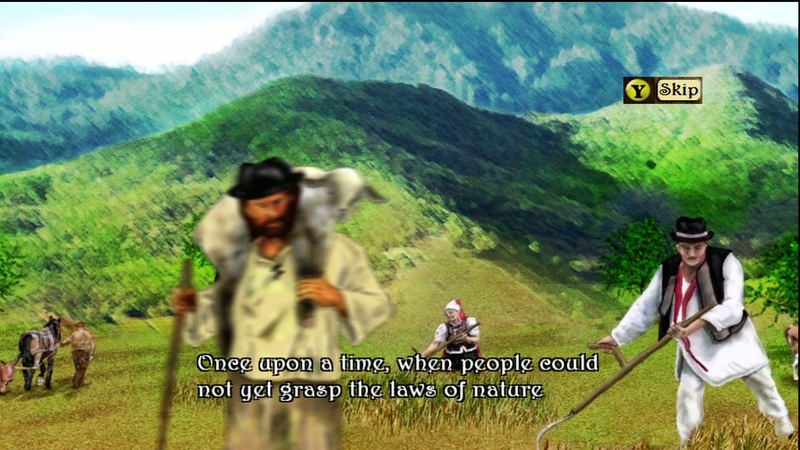 Naturally, your task is a bit more important than that, but you’ll quickly notice that practically everyone you encounter has an odd job for you to do, and they typically focus on killing a certain very large thing, then finding someone who will tell you to kill a different very large thing. Things get deeper, but the only real impact that the story has on the game is to let you know what route through the map to select in order to progress further. 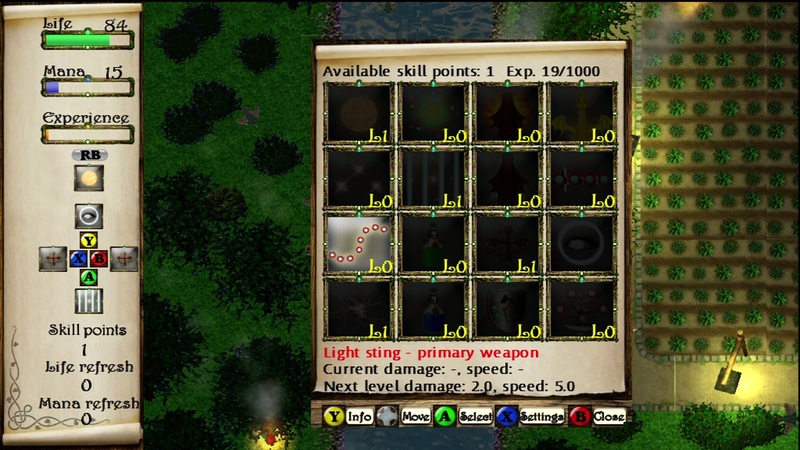 There are an awful lot of really clever ideas in this game, from little things like the level scrolling differently depending on the direction you were heading on the map, to major things, like the RPG elements and spell based strategy. The visuals are more than adequate, and the audio wasn’t terrible, but in the end I just had too much trouble grappling with unclear gameplay to really get hooked. 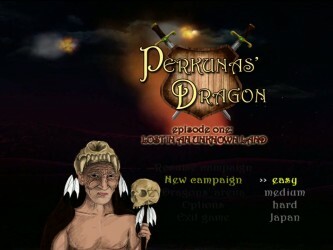 6.8 / 10: Perkunas’ Dragon has a tremendous amount of potential, and some very clever concepts, but stumbles in execution. Starlings, natural enemy of the might dragon.